Tonight I ran my first game of Pathfinder. I started the just released “Council of Thieves” adventure path. For those of you who don’t know, an adventure path is a series of scenarios that are designed to take starting level characters all the way to level 20. The scenarios are written to tell a continual story that progresses as the characters progress. 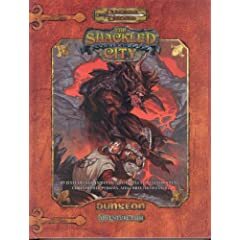 The first such adventure path was “Shackled City” and set in Forgotten Realms. DM: You each get a letter from the neighboring Kingdom of Barovia inviting you to come meet with Baron Stradh. The letter says that he has heard of your great daring in recent adventures and has need of you. Player#1: But my character is brand new. DM: Well the Baron must have heard of the adventures that your character completed in your backstory. Player#2: I thought we were in Waterdeep. There’s no nearby Kingdom called Barovia. DM: Will you people just work with me? The players I had assembled had been players I had all played with before: Auby, my girlfriend; Morgan, a female computer programmer who often brings her lesbian partner, Liz, to game with us (but she was out of town tonight); and Rob, your typical mid-thirties D&D lifer. Morgan and Rob had negotiated with each other to play Rogues who grew up in an orphanage together and developed into a compatible duo: she the brains and he the brawn. As a result, Rob’s character Milton is the only first level rogue I’ve seen with a strength of 18. Auby, after much deliberation, decided to play her usual character, a sorceress. She’s not particularly familiar with the D&D rules system and the sorceress’s limited spell selection proves a blessing to her. In essence, she has three or four different solutions to various problems that are all listed out on her spell list: if she can’t solve the problem with Burning Hands, Charm Person, or Knock (for instance) than she declare the problem beyond her. It may not be the most imaginative roleplaying, but it gets her involved. Tonight, however, Auby took a more active role in making decisions regarding character creation. She’s been working through some personal issues and has discovered that she has a lot of anger inside from growing up. I suggested to her that she play a tiefling since the setting (Cheliax) for the Council of Thieves adventure path is full of them. 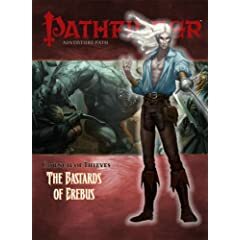 The “Bastards of Erebus” is actually a reference to tieflings, and the module contains a nice four page spread of different ability modifiers, dark gifts, and physical appearances that tieflings can have. She chose an descendant of a Khyton (a chain devil) because that variation actually gives a bonus to charisma (which is important for a sorceress) as well as a roleplaying description of being sadistic (which Auby enjoys playing). Once given this concept, Auby actually sat down and decided how she wanted to spend the 20 points of attributes I had given her and each of the other players. This was something she had never done before and was an encouraging sign that she was becoming more invested in the character. She then decided on each and every spell she would have, another thing she had never done before. The actual amount of time we spent adventuring was rather short. The PCs were invited to join a rebellion against the harsh, tyrannical government and they accepted. Their meeting place was then surrounded by Hellknights and they had to flee into the sewers. The sewers ran then through enough encounters to get them the second level before they escaped (with the traditional fare of skeletons and first level fighters). They then escaped the sewers and the game session ended soon thereafter. When they come back, they have to formulate plans to rescue the captured leader of the rebellion that the just joined. The players seemed to enjoy it. Auby was unsure as to how to dedicate her second level. Should she multiclass or stay a sorceress? Of course, more experienced players know that’s a no-brainer: you should continue to advance in your primary spellcaster levels and perhaps consider a prestige class down the road. To instead dabble in a level of wizard here, sorceress there, and a bard or two, is extremely counter productive because the magic caster levels don’t stack. I feel that’s an un-necessary flaw in the system and have been considering adding a characteristic to the magic classes called spell progression level. In essence, for the primary casters such as wizards, clerics and sorcerers, you get a spell progression level of .5 per level or advancement. A first level wizards has access to first level spells, but a third level wizard has access to second level spells. Therefore, the wizards spell progression level is .5. For the classes that cast magic as an secondary ability such as the Bard, you could have them have a spell progression level of half that of the wizard. Thus, this would allow multi class casters to build towards a coherent spell arsenal while dabbling around in magic classes the way a fighter can do with martial classes or a rogue can do with their skill list and various classes they dabble in.